Things have been pretty hectic lately. Between dealing with controversial stories at the newspaper, giant tests and projects due, and trying to figure out my life in general, it's just been one of those weeks. The thing is though, I'm ready to check out. Senioritis is fully present, and I'm just ready to be done. There's still a big control freak in me that isn't OK with giving up the paper just yet, but for the most, I'd be lying if I didn't admit that I'm looking forward to handing over the reigns to someone else. I absolutely love my job (to an almost unhealthy extent), but after four years of working at the paper, with a year and half of those as editor-in-chief, I could use a break. It's going to be nice to hand over the chaos (though wonderful) to someone else for the last week or so. So, while we're pretending like I don't just use this blog as an excuse to vent about trivial things/my exhaustion as a college student, let's talk clothes. You might remember that I borrowed this dress from Sammi via Flock Together not too long ago, but as if the dress gods themselves bestowed a gift upon me, I get to call this beauty my own now. 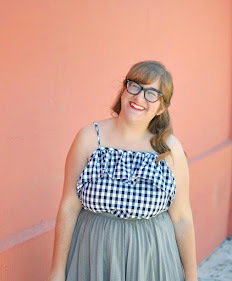 A few months ago, Sammi borrowed a dress from me that she fell in love with. It was one that I rarely touched and looked far better on her than me, so half-jokingly said that I'd swap her that dress for this one since I hadn't stopped thinking about it. To my pleasant surprise, she was for it, and I can now live in this dress. I've probably worn it once a week or so since I've gotten it just because it's so easy to throw on and fits like a dream. Plus, that print is too adorable for words. Somehow I haven't gotten pictures in it again since the first time, so I think it was due. Also in these pictures: wind. Of course, the most important thing in my life is the return of all of my favorite shows. More specifically, Game of Thrones. Now that I'm finally over (kind of) the Red Wedding, I'm over the moon excited to be back in Westeros. As if that weren't enough, Veep is back, the pilot of Silicon Valley was top-notch, and a bunch of other shows are returning soon. Ah, pure bliss. I honestly don't know how I manage to make time to watch all of these, but it happen. Priorities, right? Since I live and breathe pop culture and I write a lot of entertainment journalism, I'm thinking about just making these little entertainment sidebars into full-fledged posts every so often. I'm sure I've asked this before, but would anyone actually care to read full on pop culture posts? And by pop culture, I mostly mean TV. It's a bit of an addiction, but I can quit anytime I want. I am so glad the swap worked out well for both of you because you look darling! We are waiting to watch Game of thrones till there are several episodes. I've read the books, which is the only reason I agree to this plan of the Boy's. It's an adorable dress dear! Hang in there.... I get a little anxiety as well sometimes. YES! I would love to read some pop culture posts! ^_^ Not a fan of Game of Thrones though, this show bore me to death! Also in the pictures,wind. Oh man do I feel you on that. And this dress looks amazing on you, I am totally kicking myself for not borrowing it as the print is literally one of the cutest I have ever seen! I watched the first episode of GoT yesterday!! Ahh so excited it's back! I can't get over how cute the print on your dress is!! Lucky you, swapping cute clothes with a fellow blogger! The print on that dress is the cutest thing ever and you look adorable in it!! Wow wow wow I love that dress so much!! Awesome that you got to keep it!! Oooh girl I am so checkout out too. I took a journalism class as an elective this semester, and PROPS because it is hard. You look adorable and I love love these photos. I love pop culture so yes. Do it. I'm thinking about the same thing once this semester is over and I'm sent out into the world of finding a read job. I feel you so much about checking out of the whole school thing. 4 years of undergrad plus 2 of grad school = a very ornery Jamie. Too much school! But I digress. This dress has the absolute cutest print. Great swap! It looks super adorable on you and I'm loving those shoes too. I love reading your pop culture bits! I think that's something about your blog that's very uniquely you, and I can tell you're really passionate about it! There is soooo much good TV on right now that I have a nice little list of shows I would love to watch, but if I had to pick a new one to start, what would your absolute recommendation be? also- how cool that this was swapped to you! The dress gods really were there for you. This one is super cute and it does fit you so well! !